Anyone who is at all familiar with Tulsa's history is well aware that Tulsa was "the" place to be for everyone connected with the oil industry. For years the railroad satisfied the need of transporting people and supplies, however by the 1920s the marketplace demanded more modern transit. By the beginning of WWI many people felt that air travel was the wave of the future and Tulsans were determined to be in on the ground floor of the birth of commercial travel. Tulsa 75: A History of Tulsa reports, "The first official airfield in Tulsa was located near Admiral Place and Hudson street in 1917 by Tulsa oilman Harold Breene. It consisted of a hanger and a biplane and he offered a ride over Tulsa for $25 per passenger. On August 14, 1919 Breene's aeroplane carried a freight shipment from Tulsa to Kansas City. The event attracted nationwide attention because it was the first interstate shipment of freight by airplane. In 1921 the Curtiss Southwest Airplane Company opened an airfield, complete with two hangars, at Apache Street and Memorial Drive. Heading operations was Duncan A. McIntyre, and this facility actually became Tulsa's first airport. That same year another airport was opened at Federal Drive and Sheridan Road by a World War I British pilot, Paul Arbon." However, City in the Osage Hills: Tulsa, Oklahoma, reports the beginning of Tulsa's airports slightly differently. "... in 1917 the Chamber of Commerce formed an "aviation land site committee" to buy property and construct an airstrip and signal tower. Within two years Duncan A. McIntyre, a seasoned veteran of the barnstorming circuit, owned and operated the city's commercial airport. Located four miles east of town, by 1919 the McIntyre Airport was the second largest in the United States and the only one with runways lighted for night flights and long enough for all two-passenger planes. The airfield earned national acclaim in July 1919 with the first interstate shipment of goods that left the city, bound for a Kansas City, Missouri factory. 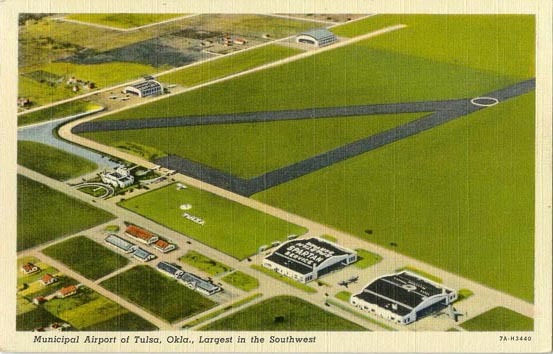 The historic Tulsa feat caught the federal government's attention, and in August Henry M Hickam, director of the National Air Service in Washington, D.C., added Tulsa as a regular stop for all transcontinental mail and military flights." Which ever is correct it was William G Skelly who was responsible for Tulsa's International Airport of today. In 1928 Skelly along with Waite Phillips, Harry Rogers, Omar K Benedict and Cyrus S Avery, organized the Tulsa Airport Corporation. They along with 42 other Tulsans signed one of Tulsa's famous Stud Notes to underwrite the construction of a major metropolitan airport for Tulsa. 390 acres was purchased just south of Mohawk Park. Runways were graded through wheat fields and a temporary combination terminal and administration building containing a passenger waiting room was constructed. The new airport was dedicated on July 3, 1928. At five o'clock that afternoon, Tulsa's first Air Mail route was established when 185 pounds of mail was flown out by Earl Rockwood. 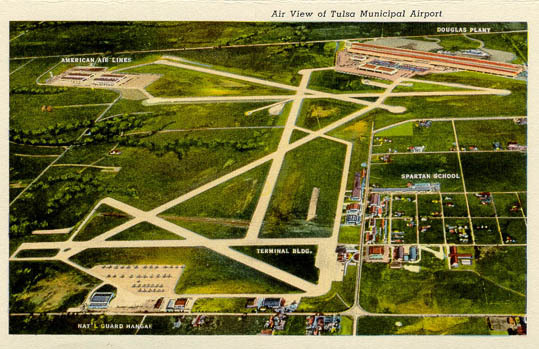 By the end of 1929 Tulsa's airport led all airports in the world in paid passenger volume. One year after the dedication the temporary buildings were replaced with brick and steel hangars, landing lights were installed and construction of concrete taxi strips was underway. By 1930, the regions first radio beacon and revolving light on a 50 foot tower visible for 55 miles had been erected at the airport. It was also in 1930 that Tulsa voters passed a bond issue to pay back the 47 Tulsans who signed the original Stud Note and take possession of the airport.